Does ebay work in Lebanon? Absolutely! Use the website version for Lebanese customers, or use eBay to shop to family and friends there. Here’s my 2019 guide. No need for PayPal, or sweat trying to find shipping to Beirut, Zahle, Tripoli or elsewhere in Lebanon. The “global eBay website” is aimed at customers there. You can follow this handy guide on how online shopping works from shipping, delivery, payments to searching through Lebanese eBay sellers. Enjoy. The site automatically detects a users location, and serves a localized version of eBay depending on that location, in Lebanon and elsewhere. Mainly, it knows to show you relevant search results that support shipping to the country. However, there are these settings you can also try! You’d be surprised how many eBay sellers there are from Lebanon, so it’s worth doing a search if you can find items locally for cheap and fast shipping. Step 2. Fill in search with whatever product or item you are looking for. Step 3. Before hitting the search button, scroll down to “located in” settings where you can select “Lebanon” as the country to narrow down searches for. Step 4. Conduct your search, from Lebanese eBay sellers only..! Common use for eBay is online shopping from Asian sellers, providing an extensive range of goods with affordable prices. Here’s how. Step 2. Do a regular search for whichever product or item you need. Step 3. Notice the additional settings on your left at the results page. You can quickly narrow down these results to Asia (or other regions) only. 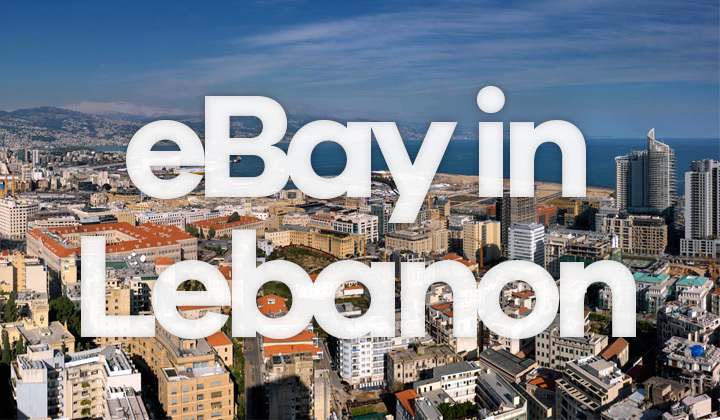 Being a highly global marketplace, majority of items taking part in eBay’s global shipping program can be delivered to Lebanon. The shipping options supported however, will vary depending on the seller. And advice I often give to buyers on eBay is to contact sellers directly through the portal and ask for a custom shipping method and quote that suits you best. When your internet connection is located within Lebanon, shipping costs are calculated automatically. For those located outside of the country, it’s also pretty easy to just check the product page and select the desired shipping country for estimates. The cost and time it takes for orders to arrive to Lebanese addresses does vary greatly. But depending on the type of item you have more availability and choice. Cities that are supported for international shipping are; Baalbek, Sidon, Aley, Zahle, Beirut, Tyre, Tripoli, Jounieh to name a few examples. Currently eBay does not support the localization of currencies to Lebanese pound, like it does for many other countries nowadays. Pricing is displayed in USD. However, payments should not be a problem and there is no need to use a PayPal account. You can simply pay by debit or credit card. Another popular payment method, is to use prepaid Visa or MasterCard cards which are becoming a popular options for online shopping payments. QUIQ, Fransabank, Bankmed and many more offer them. Many sellers are international, looking to enter the e-commerce market in Beirut and elsewhere. It’s easy Thanks to the global shipping program provided by eBay. The online shopping market is growing in Lebanon, and popularity of eBay is expected to rise together with competing online store retail outlets. If there will be a dedicated eBay.lb domain and website is yet to be seen. Did this answer the question if eBay is available in Lebanon? Let me know in the comments or ask for more details. Very happy you could visit my website. Huge thanks and good luck with online shopping, David. I’ll mention again, that sometimes the posts that you may be reading on this blog have affiliate links that the author (me) can benefit from. This keeps the content going, and helps my personal life financially and to do my best. Thank you.